This is the power of the Cisco® Digital Network Architecture (Cisco DNA). All switches ship with one of the five power supplies (350WAC, 715WAC, 750WAC, 1100WAC, or 440WDC). Figures 1 through 4 show the Cisco Catalyst 3850 Series Switches. Table 1 shows the Cisco Catalyst 3850 Series configurations. 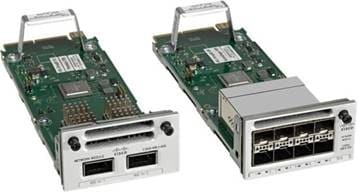 The Cisco Catalyst 3850 Series Switches support five optional network modules for uplink ports. The default switch configuration does not include the network module. At the time of switch purchase the customer has the flexibility to choose from the network modules described in Table 2. The C3850-NM-4-10G module is supported only on the 48-port Gigabit Ethernet models or on the 12-port or higher 10 Gigabit Ethernet models. The C3850-NM-8x10G and C3850-NM-2x40G modules are supported on the 24-port and 48-port multigigabit switches and also on the 24-port 10G SFP+ switch model. The C3850-NM-4-1G and C3850-NM-2-10G modules are not supported on the 12-port and 24-port SFP+ models. An SFP+ receptacle supports both 10 Gigabit Ethernet and Gigabit Ethernet modules, allowing customers to use their investment in Gigabit Ethernet SFP modules and upgrade to 10 Gigabit Ethernet when business demands change without having to do a comprehensive upgrade of the access switch. In contrast, SFP receptacles can be used only as Gigabit Ethernet ports, as shown in the examples in Table 3.